The various components of the interconnection network model inside gem5's ruby memory system are described here. The default network is simple, and the default topology is crossbar. The connection between the various controllers are specified via python files. All external links (between the controllers and routers) are bi-directional. All internal links (between routers) are uni-directional -- this allows a per-direction weight on each link to bias routing decisions. Crossbar: Each controller (L1/L2/Directory) is connected to a simple switch. Each switch is connected to a central switch (modeling the crossbar). This can be invoked from command line by --topology=Crossbar. 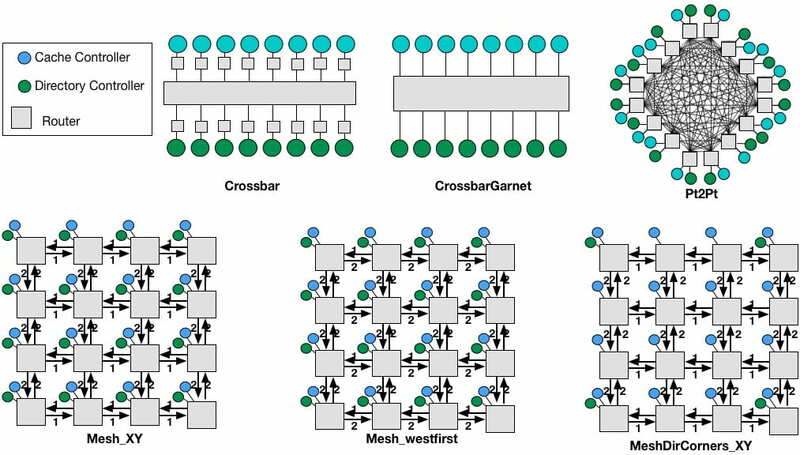 CrossbarGarnet: Each controller (L1/L2/Directory) is connected to every other controller via one garnet router (which internally models the crossbar and allocator). This can be invoked from command line by --topology=CrossbarGarnet. Mesh_*: This topology requires the number of directories to be equal to the number of cpus. The number of routers/switches is equal to the number of cpus in the system. Each router/switch is connected to one L1, one L2 (if present), and one Directory. The number of rows in the mesh has to be specified by --mesh-rows. This parameter enables the creation of non-symmetrical meshes too. MeshDirCorners_XY: This topology requires the number of directories to be equal to 4. number of routers/switches is equal to the number of cpus in the system. Each router/switch is connected to one L1, one L2 (if present). Each corner router/switch is connected to one Directory. It can be invoked from command line by --topology=MeshDirCorners_XY. The number of rows in the mesh has to be specified by --mesh-rows. The XY routing algorithm is used. Pt2Pt: Each controller (L1/L2/Directory) is connected to every other controller via a direct link. This can be invoked from command line by --topology=Pt2Pt. latency: latency of traversal within the link. weight: weight associated with this link. This parameter is used by the routing table while deciding routes, as explained next in Routing. src_outport: String with name for output port from source router. dst_inport: String with name for input port at destination router. These two parameters can be used by routers to implement custom routing algorithms in garnet2.0 (see Routing. latency: latency of each router. Only supported by garnet2.0. Table-based Routing (Default): Based on the topology, shortest path graph traversals are used to populate routing tables at each router/switch. This is done in src/mem/ruby/network/Topology.cc The default routing algorithm is table-based and tries to choose the route with minimum number of link traversals. Links can be given weights in the topology files to model different routing algorithms. For example, in Mesh_XY.py and MeshDirCorners_XY.py Y-direction links are given weights of 2, while X-direction links are given weights of 1, resulting in XY traversals. In Mesh_westfirst.py, the west-links are given weights of 1, and all other links are given weights of 2. In garnet2.0, the routing algorithm randomly chooses between links with equal weights. In simple network, it statically chooses between links with equal weights. Ruby supports two network models, Simple and Garnet, which trade-off detailed modeling versus simulation speed respectively. Details of the Simple Network are here. Details of the original (2009) Garnet network are here. This design is no longer supported in the codebase. Details of the new (2016) Garnet2.0 network are here. The interconnection networks can be run in a standalone manner and fed with synthetic traffic. We recommend doing this with garnet2.0. This page was last edited on 7 November 2017, at 08:56.